The #sfsa2019 is jointly produced by GEN2REV MEDIA and RADIS GLOBAL CONCEPTS. 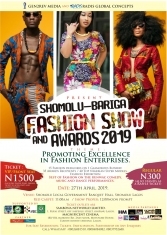 #SFSA2019 will be an exciting runway and exhibition event at the SHOMOLU L.G BANQUET HALL, SHOMOLU. #SFSA2019 will features 50 Models, 15 Fashion Designers, 10 Nigerian music artists and as well as a crowd of over a thousand fashion lovers and buyers. The #SFSA2019 will also features exhibition arena for brands and sponsors to connect with over a thousand #sfsa guests. 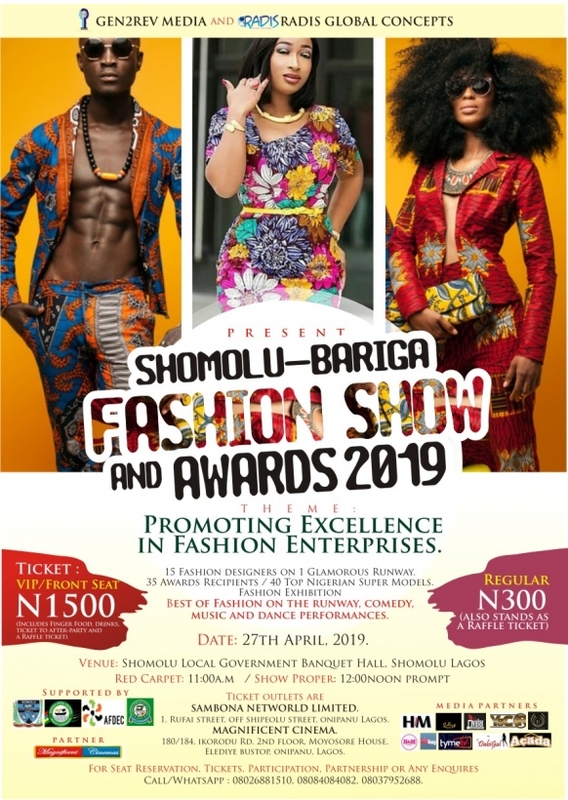 FEATURES: The 2019 SHOMOLU FASHION SHOW AND AWARDS will features 50 Models, 15 Fashion Designers, 10 Nigerian music artists with a grand opening of a dance performance. There will be exhibition tables to enable SFSA guests to shop for fashion items at discounted prices.